Handmade sofa sports high, welted roll arms and seating tailored in light brown top-grain leather atop a hardwood frame with flared legs. The classic roll arm silhouette gets a timelessly chic update with the Letizia sofa from Natuzzi Editions. Handmade with a hardwood frame, this heirloom-quality sofa flaunts high rolled arms and a wooden base with flared legs, subtle touches that offer serious style. 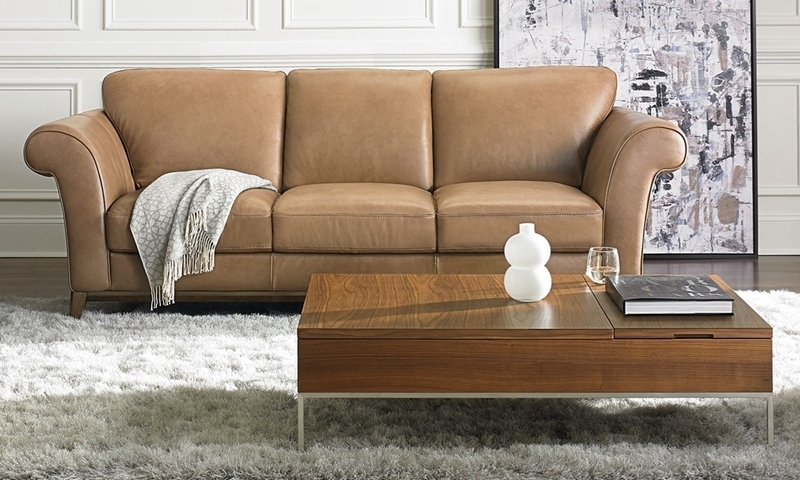 Café-au-lait-colored top-grain leather covers the comfortable seating and self-welted arms of this 92-inch sofa for a luxe, tailored addition to your living room.